Well, I finally did it (for those of you who don’t know what “it” is, you can find out here or take a wild guess from looking up). After months of mental planning, pattern scouring, and color matching, I’ve finally finished my very first fair isle sweater! I feel that this is a very momentous occasion that happens just once in every young man’s life (the knitter’s equivalent of a bar-mitzvah. bar-knitzvah. 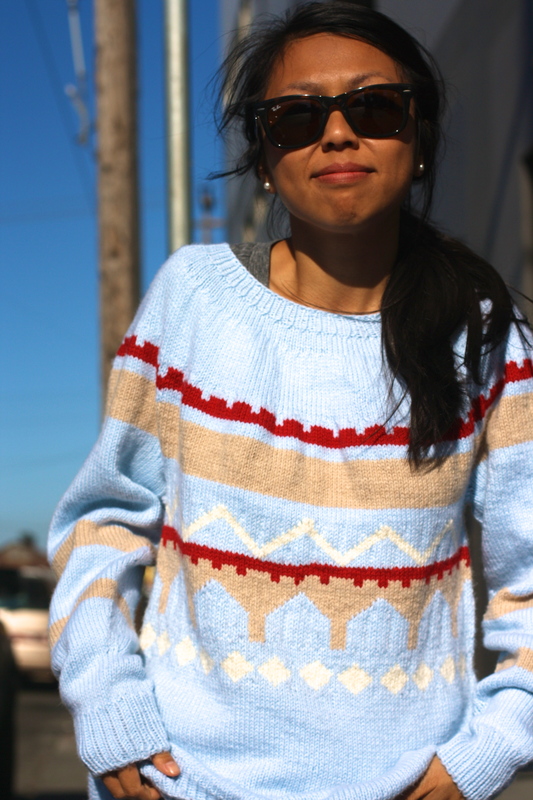 ), and I will always remember the love and care I poured into this sweater. 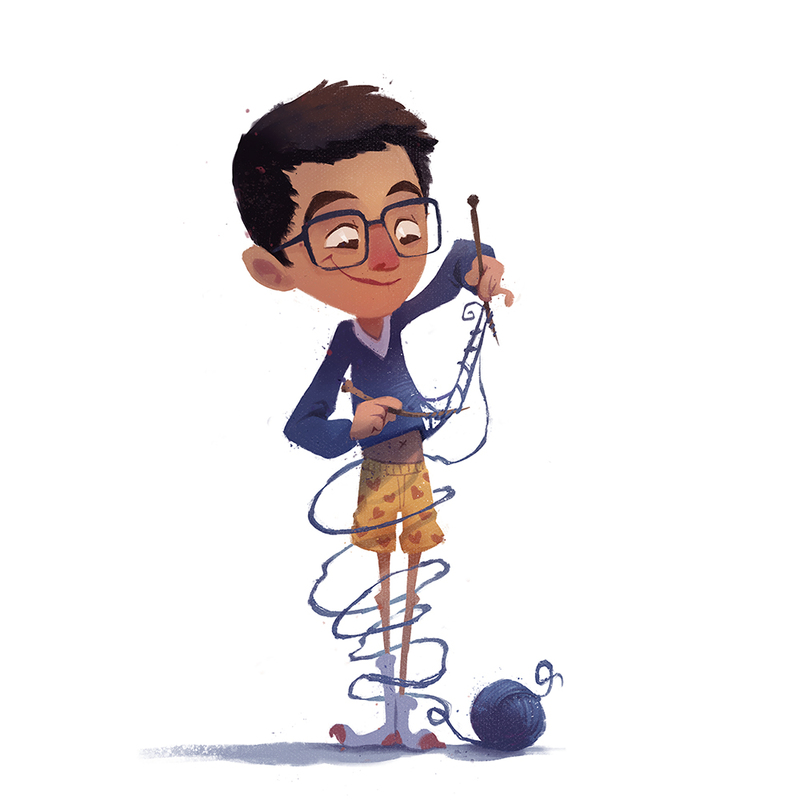 Oh yeah, and knitting. I poured a bunch of that in there too. 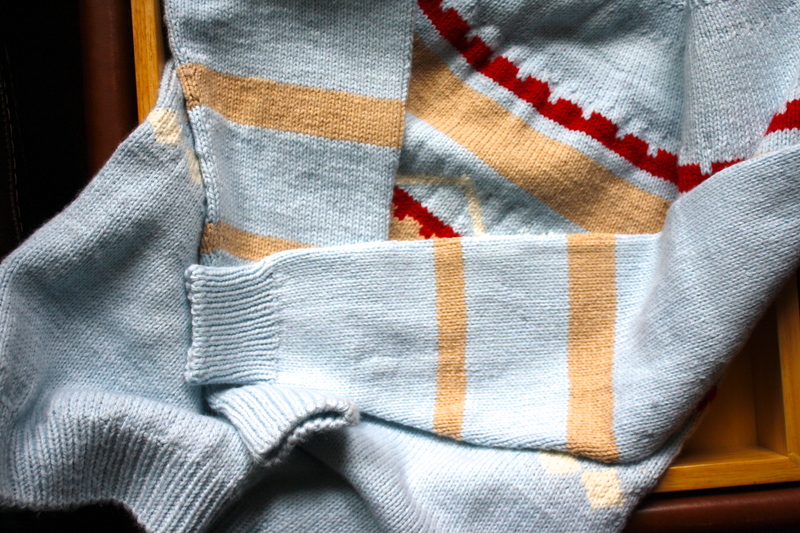 Anyway, I was so excited when I finished this sweater that I couldn’t wait to capture its elegance on camera. So I at once went to our single square foot of photogenic space in our house and took some pics there, but, as you can tell, it’s a bit outgrown for that, so I busted out my sister’s dressform (let’s face it. at this point, I use it so much it’s essentially mine) and proceeded to carry it all around the house and up and down my block looking for the perfect place to pose it. All in all, it was a very successful photo shoot (except for the fact that I got winded 15 minutes in and had to take a breather. I understand now why fashion designers hire actual people to model their clothes). Since I explained the specs of this sweater in my previous post, I’ll spare all of you the knitty-gritty and just say a little about these pictures (which I’m pretty sure is the reason why 98% of you are here). According to what I see on instagram and the 3 people I follow, symmetry is good, and who knew I’d find it right in front of my own house! Also, it turns out the old, worn down, dirty look that my porch got from years of wind, rain, and neglect (except that one shiny doorknob on the right that my dad found on the street) actually makes it pretty cool. It emanates a rustic vibe, which on the one hand contrasts with the modernity of the industrialized black and nylon of the dressform, while on the other hand echoes the conservative traditionalism that imbues the culture of knitting. Moreover, the centuries of history surrounding fair isle patterns add uncountable years to this image, to which not even the worn out lettering of the welcome mats or the white washed fade of the doors could compare. It is both an ambivalent struggle and a synergic harmony existing simultaneously between generations united by thread, yet held forcibly apart by ages of words, stories, lives, change. 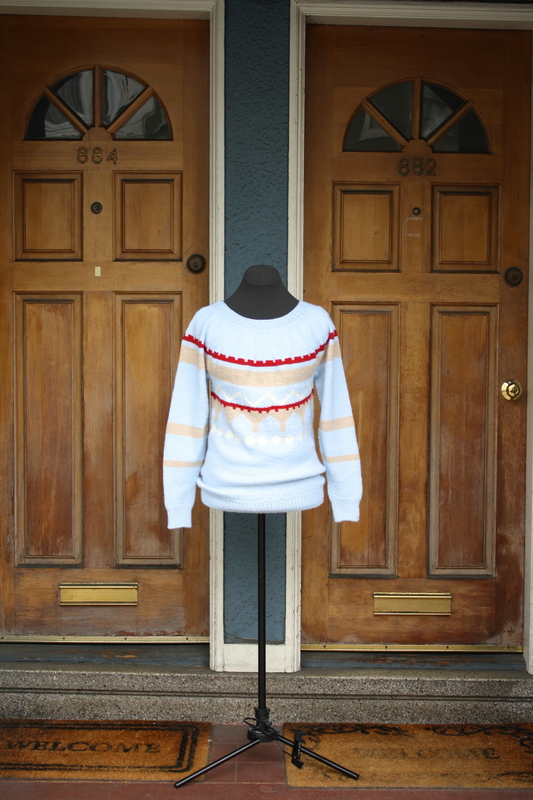 The centrality of the sweater hypnotizes the viewer with its simplistic nature and the ad hoc clash that invariably comes with contemporary fashion. Yet, the parallel double doors behind serve as an homage to times past, persistently reminding us that what has been will one day come to be once more. You’ll have to excuse my language. I’ve been reading Umberto Eco, lately (I just made a literary joke!). And here’s one of her imitating the sartorial prototype. The resemblance is uncanny! 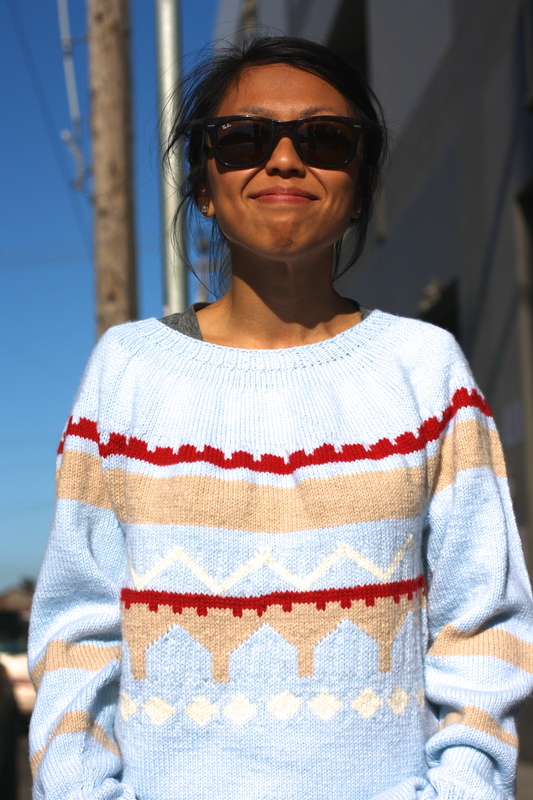 In the past few (and by few I mean 6) months I’ve been working on this sweater, I’ve taken it to some pretty public places. And as a male knitter making a baby blue sweater on the T line to Bayview, one might think that my greatest source of embarrassment (and mortal terror) is my knitting. If only that were true. Unfortunately, my ultimate shame lies elsewhere, in my taste in music. However, about a month ago, my noise nirvana (that’s the absolute last music alliteration I’ve got) was rudely disrupted when I discovered an unsettling truth about myself: I love Ed Sheeran (before I go on, let me kindly redirect you Ed Sheeran fanatics who’ve accidentally googled your way onto my blog to the site you were probably looking for). For the longest time I tried to deny it. At first I just thought there was a catchy beat to his songs, with no real substance to my affection. And later, as things progressed, I convinced myself that he only had one or two good songs that were anomalies I just happened to like (e.g. Taylor Swift’s I Knew You Were Trouble, R. Kelly’s World’s Greatest, Ursula’s Poor Unfortunate Souls). But ultimately, as I found myself listening to more and more of him, I had to face the music the facts (c’mon. I’ve used some pretty bad puns before, but let’s have some standards, okay?) that I genuinely like Ed Sheeran’s music. Now, you might be asking, “So you like a 22 year-old popstar whose voice could melt butter, what’s the big deal?” Well, the fact is, Ed (may I call him Ed?) is mainstream. Super mainstream. And just as I disliked being the only one listening to Stacie Orrico’s More to Life, I also had this aversion to being crammed onto the bandwagon along with millions of preteen girls (I know there are rumors going around, but there is NO WAY he’s dating Selena Gomez. He can do waaaay better than that). At first I thought that these feelings of ambivalence were just a natural part of the musician-fan relationship, but as I pressed SUBMIT on my primary application to medical school (I bet you didn’t see THAT coming! ), I realized that my objection to the ordinary was rooted deeper within me. This year, over 400,000 eager beaver doctors-to-be will be applying to med school, and I am one of them. I’ll admit, my grades and MCAT score are decent (and dare I say competitive), but I know there are many out there who’ve done better than me, fating me to the large “pretty good, but not the best” folder that I’m sure every admissions officer keeps. And that’s what bugs a lot of people: the fact that, despite everything they’ve done and accomplished, someone out there will just be seeing them as applicant #23,472, the guy who came after applicant #23,471. There’s something about being a part of a large group that’s unsettling. It takes a safety pin to that ego you’ve been so generously inflating and reminds you that you are not the only one, that there is probably someone halfway across the country (or next door, if you’re really unlucky) who can do everything you can. Many of us flee from such a realization, throwing themselves deep into a task in pursuit of becoming the absolute best (coughicanknitfairislesweaterscough) or running out to the boonies to find some random skill that sets them apart from everyone else (I can sneeze with my eyes open). But in the end, we all succumb to statistics. We are 1 in 6,000,000,000, and the population is not likely to get any smaller. So rather than sticking our heads in the sand praying that we’re the only ones who’ve performed Sorting Hat songs in the middle of the Grand Canyon as a part of an elaborate ritual in honor of Nymphadora Tonks (SFNHPFDoors4lyfe), we should take comfort in knowing that there are others who share our interests and understand our (not so) unique experiences, because the alternative is such a lonely way to live. Tomorrow, I will be seeing Ed Sheeran live at Golden Gate Park. Say hi to me if you see me, but I’ll probably be just another face in the crowd. ***Umberto Eco, author of international best-sellers such as “The Name of the Rose” and “Foucault’s Pendulum,” is also known for his work in semiotics, which is the study of signs, symbols, and metaphor. A very lovely sweater, indeed, made with much time and care as evidenced by the lack of puckering and pinching from the color changes. It looks much better when it’s on a live person such as your beautiful model. I know her!!! She was a student of mine waaaaay back. 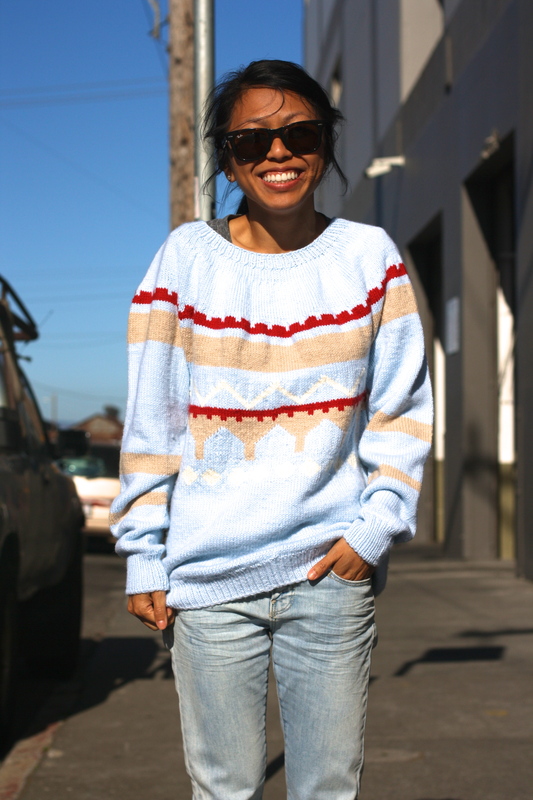 Congratulations on this fair isle sweater.